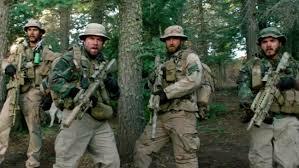 A grim chapter in Navy SEALs history earns a heroic, no-punches-pulled accounting in “Lone Survivor,” an above average action outing for Mark Wahlberg & Co.
Based on the true story of the ill-fated SEAL Team 10 and a mission that went messy in 2005, it is still very much a movie. A few scenes, a few sentiments and the tone seem inspired by the John Wayne flag-waver “The Green Berets,” an another war film about another battle in another war (Vietnam), but also one where victory is spun out of something that looked nothing like victory at the time. Wahlberg, Ben Foster (“3:10 to Yuma”), Taylor Kitsch (“John Carter,” “Battleship”) and Emile Hirsch (“Into the Wild”) are SEALs dropped off in Afghanistan to kill a Taliban leader. “Rules of Engagement” are debated and are blamed for things going wrong. It’s the mountains, so communications are poor. And one bad thing leads to another as this intrepid team tries to shoot its way through every AK-47 toting Taliban between there and rescue. Writer-director Peter Berg, recovering from “Battleship,” frames his film within the culture of these fighting men, opening with real scenes of the brutal training (and wash-out rituals) of the SEALs. Their code is in the clipped, hard language exchanged between officers (Eric Bana is in charge of the mission) and the men who do the dirty work. The “helluva big gunfight” that breaks out as their mission unravels is shot in extreme close-ups, bursts of blood squirting up through the dust, gurgling, sucking wounds and the ringing, temporary deafness of a round that exploded too close to your head. Much of this stuff is excruciatingly real. If nothing else, Berg forces us to appreciate the code these men live by and the toughness that is beaten into them, toughness that keeps them going as the wounds pile up even as they dole out kill-shots by the score on their numberless foes. But the saga takes many a melodramatic turn as team is whittled down and rescue becomes more remote as a possibility. The third act where the film’s “true story” origins start to beggar belief in the worst John Wayne movie fashion. Fact-based or not, events turn cinematically familiar and far-fetched. “Lone Survivor” — yeah, the title gives too much away — contains some of the most brutally vivid combat footage ever filmed. The characters are only superficially sketched in, but we still fear for them, understand their code and above all else, appreciate the dirty, bloody, high-risk work these professionals do. That they go through all this and risk everything, by choice, is something Berg, to his credit, never lets us forget. Credits: Written and directed by Peter Berg. A Universal release. If you read Latrell’s book and his followup book you realize that Hollywood did not have to go over top with the fight or his battle for survival. It is hard for us to imagine the intensity of people like Navy SEALS or the unique bond that those in combat share. I for one am grateful we have people like this protecting this country. It leaves us free to do this! I would agree with Roger in Orlando that it starts off with good intentions and thend descends into the cliche of many American war films.when the enemy gets shot (with a 5.56 round) they die, when the US troops get shot (with a larger 7.62 round) they brush it off almost like a bee sting! Another thing prevalent in “Black Hawk Down”, “We were soldiers” (Mel Gibson) and Lone Survivor is that one or two soldiers get wounded and then legions of soldiers get slaughtered trying to save them! The jumping off cliffs sections seemed very unrealistic and downright ridiculous when I was watching it! I too support the soldiers no matter how misguided the cause is. Sing it, pal. Even true stories are filmed with a decision about which “truths” they included. And sometimes, that plays likes a war movie cliche. err…the 5.56 M16/M4 round is basically the same as a 0.22 airgun pellet, that’s why the SAS has switched to the larger 7.62 caliber as the Taliban don’t respond too well to being shot with them when they are jacked up with amphetamines, it irritates them whilst the 7.62 round puts them in the ground! You’d say this is a “pretty good movie” especially being made about an ongoing war. You can see giving it 3.5 stars. You’d say it shows the hell of war and the toughness required of warriors. You’d say it shows the tragedy of young lives cut short. I’d say, if you think about the movie and the whole situation, it shows as well as any movie the idiocy of continuing this war, the idiocy of the US military mentality, and the idiocy of a whole national culture that justifies and accepts this war. The SEAL training program selects and develops men (no women, evidently) with the best physical strength and endurance, and the drive to outlast their competitors. It does absolutely nothing to prepare them for their mission in a foreign country and culture. The specific mission in the film is a “covert” assassination of a Taliban commander who is a “bad guy” because he was able to kill 20 Marines (does it occur to anyone that all enemy commanders intend to kill their enemy. which happens to be our side?). In a “conventional” war situation, this would just be a recon team, who would determine the location and strength of the entire enemy force and then return to base, where plans for a full-scale attack would be made. In fact, that could probably have been done by drone. The movie doesn’t give any reason that neither drones nor a full assault are considered. Be that as it may–the assassination team is used; they have the physical stamina to hike through rugged terrain, carrying heavy gear and weaponry; they are obviously homesick and obsess over their loved ones in the US during the entire mission; and they don’t have a clue what to do when they encounter (surprise! imagine this in Afghanistan!) Afghan people. They don’t speak or understand any Pashto; they barely conceal themselves during daylight; their “ethical” discussion of what to do with their captives turns into “kill them for our own survival” vs. “let them go or we will cause a PR nightmare”. This is war at it’s most chaotic and wasteful, on both sides. We get to see the heroism and tragedy of the American side; the Taliban side is depicted as an inexhaustible sequence of human “obstacles” who very, very slowly manage to take out the team members. OK audience, can we stop a second and ask ourselves just what the hell is going on here? If the Taliban is a wicked, incompetent enemy, why isn’t the full force of US military brought against them? If they are living with, soldiering among, and drawing resources from the country as a whole, then maybe we (the US military) are not just attacking the Taliban, but in fact attacking the country as a whole? Maybe that explains the “reticence” and the “PR issues”? Mark Wahlberg’s character epitomizes the consternation. He is rescued and protected by Afghan civilians. He doesn’t know why. He never finds out why. I don’t think we do either. I don’t buy the Pashtunwali explanation given during the credits, certainly not at face value. No one is an innocent victim here. Not the Taliban soldiers, who know they will be fighting a technologically superior enemy. Not the assassination team, who should have been aware of their vulnerability. Not the US military commanders, who are so immersed in the culture of war fighting that they cannot think about what the war is about. Not the “friendly” villagers, who understood very well the conflicts with their neighbors and the fact of the war. And not us, the audience, who are so removed from the reality of the war that we think we have the right to “appreciate” it without having to bother to think about its underlying reasons for being.